I've been so excited for fall! I love the cooler weather, the smell of burning leaves, and all the seasonal flavors. To celebrate, I've decided to do 10 different apple recipes over the next month. 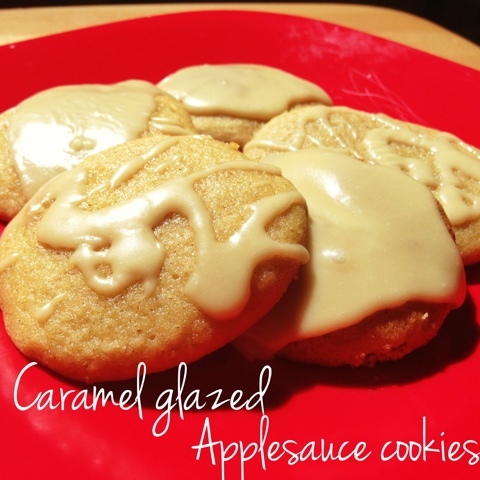 This one is a great fall dessert made with applesauce. The cakey cookies are delicious and make your house smell amazing! The caramel glaze adds the perfect touch. Welcome to fall baking on Katy's Kitchen! 1. Preheat oven to 375 degrees. Line baking sheet with parchment paper. 2. In a mixer, cream sugar and butter. 3. Add in eggs and applesauce and mix well. 4. Add baking powder, baking soda, cinnamon, and nutmeg to mix. After those are mixed in, add the flour 1/2 c at a time until incorporated. 5. Drop cookie dough onto baking sheet with a spoon. Bake for 10-13 minutes until the cookies are light brown. 1. After cookies have cooled completely, melted stick of butter in a small saucepan. 2. Add in packed brown sugar, stir frequently. 3. Once brown sugar starts to boil, stir constantly for 2 minutes. 4. After two minutes, add in milk a little bit at a time. Once it begins to boil again, remove it from heat. 5. Transfer carmel mixture to mixing bowl. Let cool for 20 minutes. 6. Add in powdered sugar a little bit at a time. Once fully incorporated, glaze cookies.